Welcome to my home office! Okay, this is only a portion of the room, the rest is still under “redo”. 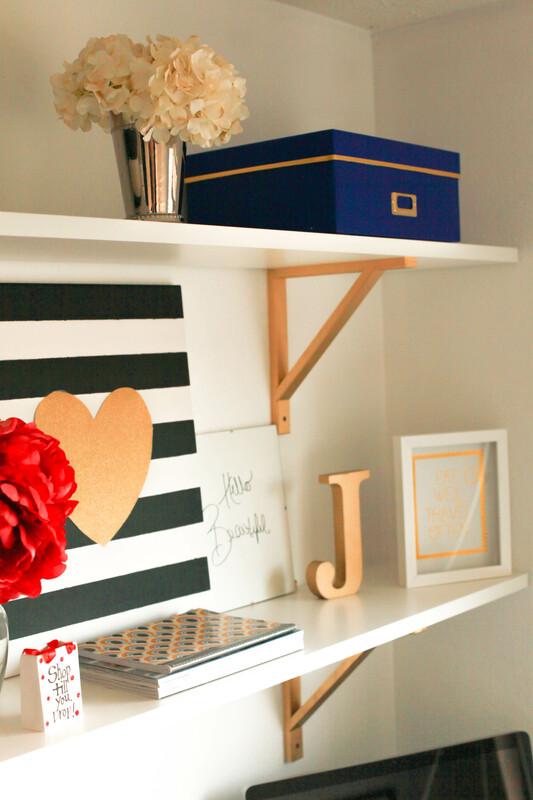 I could not wait to share these pretty gold and white shelves with you all, so here is a little sneak peek into our home office! These shelves have been on my to do list for quite sometime and we finally made a trip to IKEA to pick up our supplies. These brackets came in plain wood from IKEA, however, I used a gold spray paint to make them pretty. These plain white shelves are also from IKEA and came as you see here in the photos. After painting the brackets, I grabbed my handyman, a drill and a few screws. Ta-daaaa! My little blogging places is now complete. 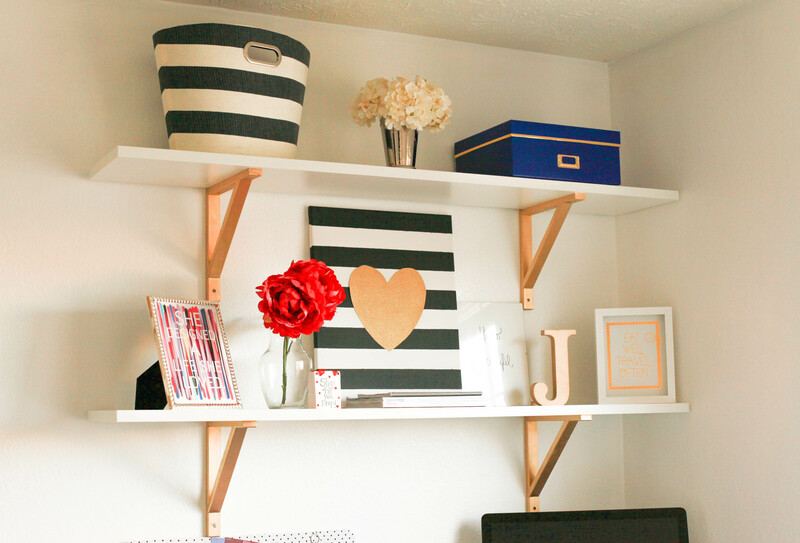 If you are looking for easy installation and fairly inexpensive shelves, these are a great fit. It adds so much to my walls. Once the entire room is complete, I will show post a before and after of this room! Total transformation without a large budget. I hope you all enjoyed your weekend and begin this week off right. Happy Monday. 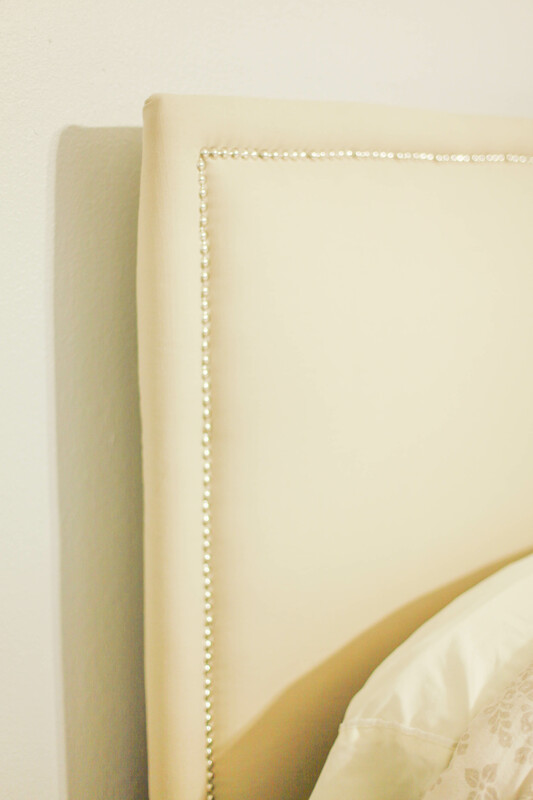 First, before buying any supplies, you will want to measure the width and heighth you would like your headboard. Some people prefer a headboard to go well below the mattress and others just enough to be covered. Others may also want it to be wider than the actual mattress. I have a king size bed and preferred it to go pretty far down to the frame of the bed. After you have your measurements, you can now head to your local hardware store. Since we did not have a big truck to haul home a piece of large plywood, we had it cut down in the store. Most will do this for a small fee for you! You can see where my husband connected the two pieces with a 2X4 he had cut in half. The other 2X4 was used as the ‘legs’ to attach the headboard to the frame of the bed. Once you have your wood either in one piece or in two pieces connected with the 2X4’s, you are ready to nail your foam to the wood. I used two double/queen eggshell foam bedding pieces from Walmart. I paid about $20 for both of them. Foam at the craft store can be pricey, but this was a way to save some money. 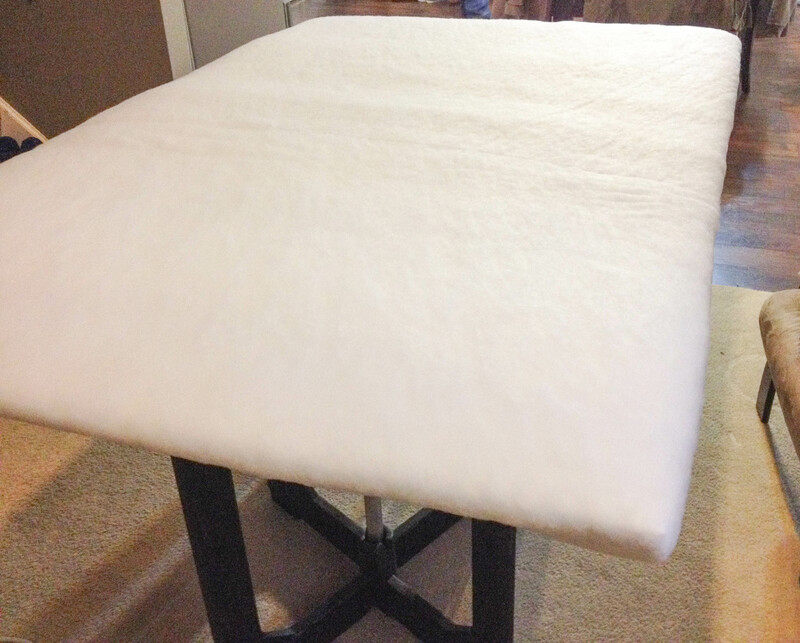 Once I covered the ‘front’ of the headboard in foam (no eggshells facing up because you want a smooth texture), I then tightly wrapped batting over the top. Using the nail gun again to adhere the batting in place. From here you can see the second ‘in progress’ photo showing the steps above. 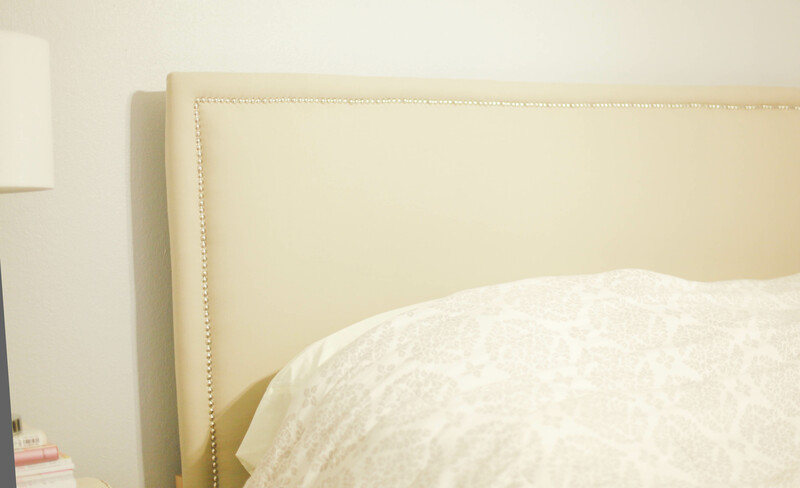 Make sure your fabric is clean and wrinkle free before using it on the headboard. You want a durable upholstery fabric. Now with your upholstery fabric you must tightly wrap the headboard. Make sure your corners are wrapped neatly and all edges go a few inches behind the front in order to look nice to the eye. Next you will want to put the ‘legs’ on the headboard or you can chose to mount the headboard onto your wall if you chose. From here you will then add the nail head trim. Please measure and draw a faint line to keep correct spacing from your edge of the headboard to where the nail head trim will be placed. This will also help keep the trim in a straight line. Again, tightly adhere the trim to keep fabric in place and keep the headboard looking nice. 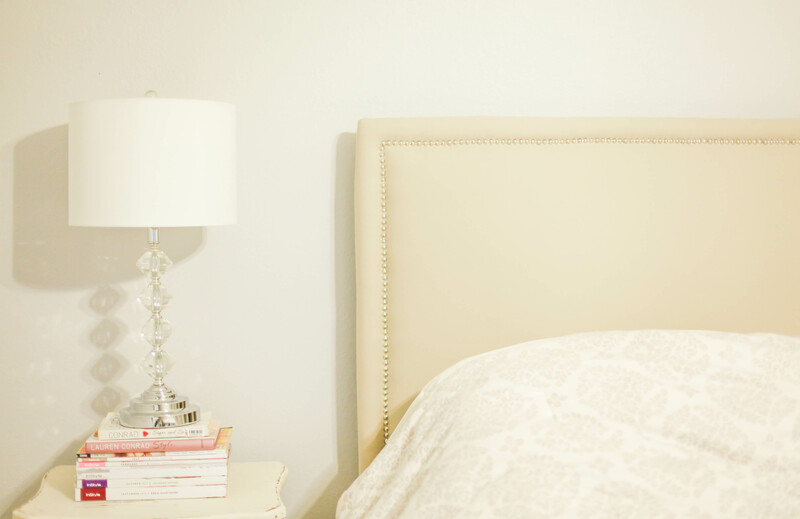 And just like that you have a nice looking headboard that cost you a fraction of the price and a simple DIY project for the home. Happy Sunday! I love DIY’s and especially this one. Not only do you get to be a little crafty, but it saves you money. It comes out cheaper than what you would pay for this home decor piece at a retail store. My total cost was between $5-$7 bucks. 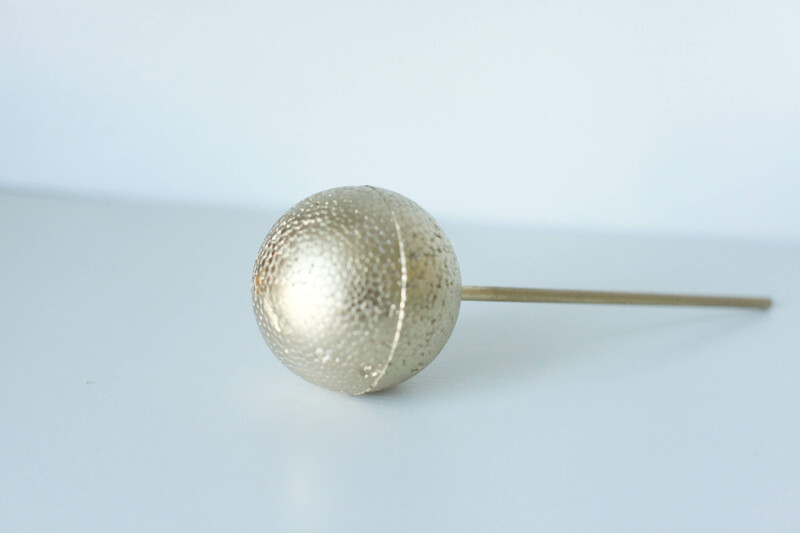 While shopping around, I found a look alike gold sea urchin piece of home decor for $20 and up. It is a painless crafty project that you can have done in no time. You can also make a half option if you want to set it on a stack of books. You would just cut the sphere in half and follow all other steps below. 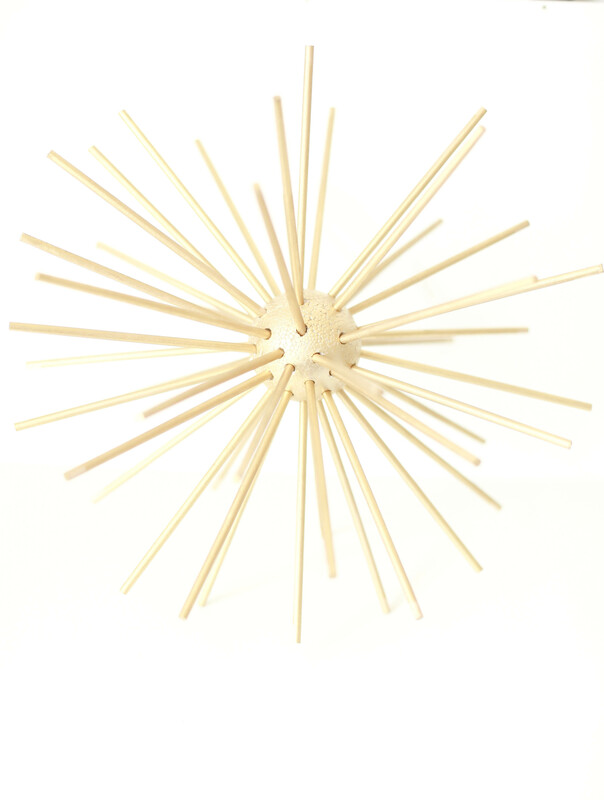 For now, the directions below will go over how to make a larger sea urchin as seen in the photo above. I know, funny name for a home decor accessory. -Something to poke your sticks threw and stand up for painting, I used floral foam that I had on hand. 2. 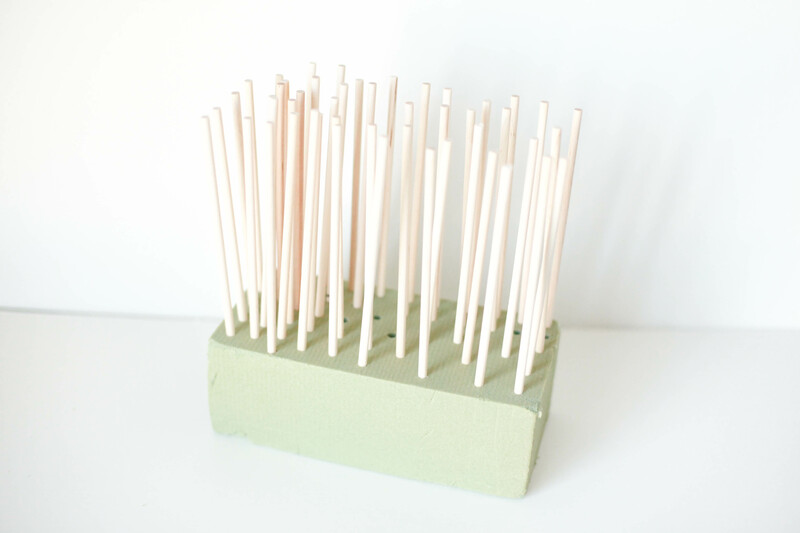 Set up the dowel rods on your holder to get ready to paint. 3. 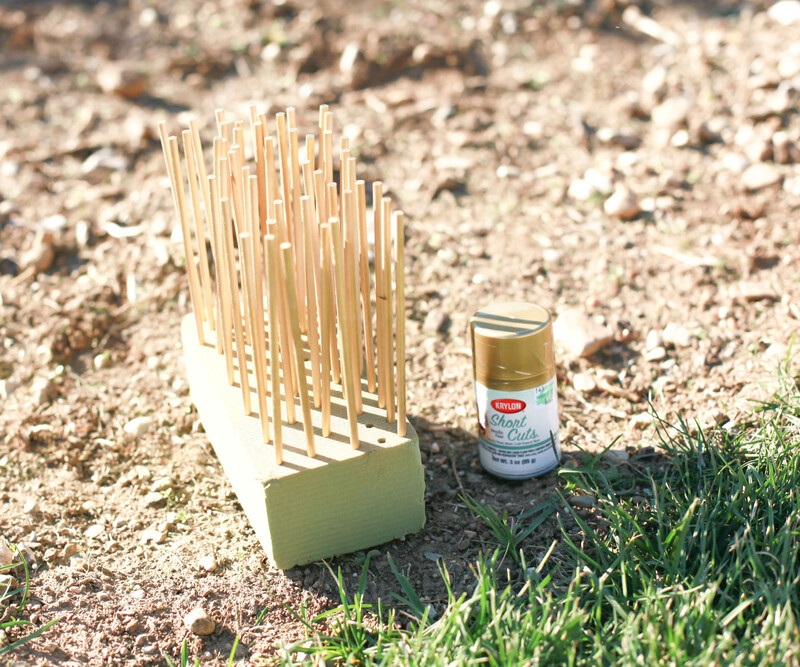 With your gold spray paint, put a few coats on all rods. Make sure to get all angles painted evenly. 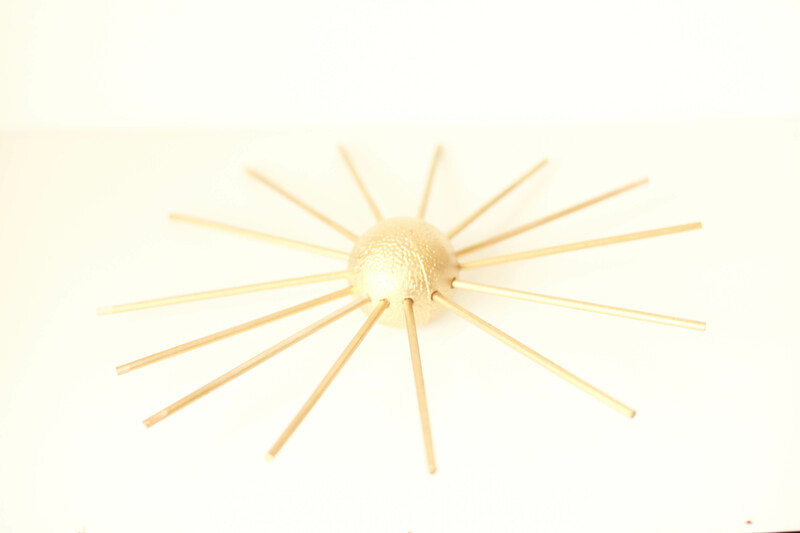 Do not worry about the part that is in the holder, it will go inside the ball and not be seen. Also, spray paint the ball with your paint. 4. Take your screwdriver and puncture holes into the ball. Keep the puncture holes spaced the same, see the picture below. Mine are pretty spaced out because that is what I prefer. 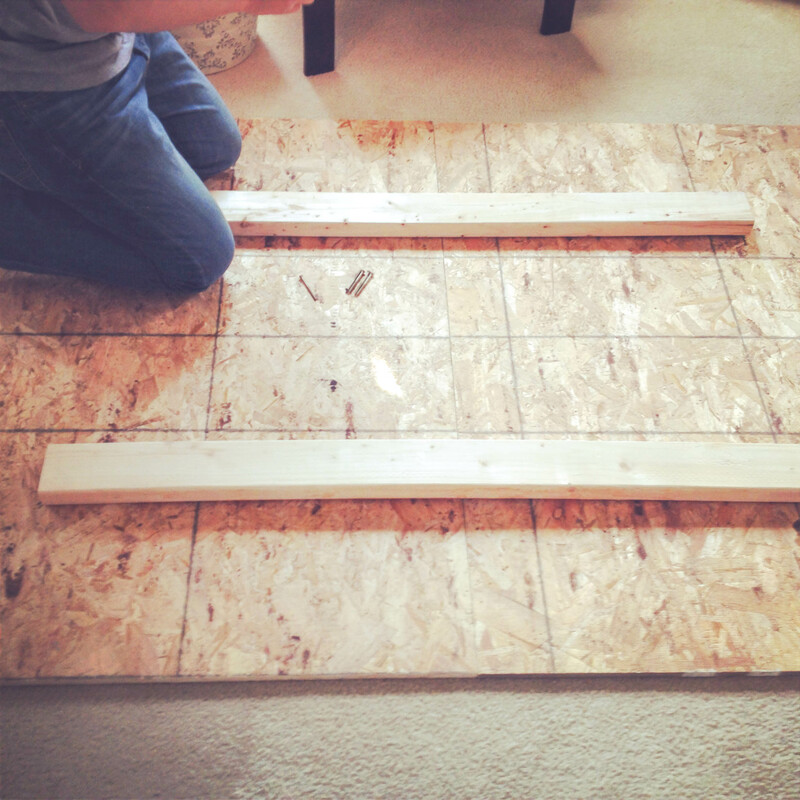 You can put yours closer together, however, you will need more dowel rods. OPTIONAL: You can glue loose rods so they will stay more in place. 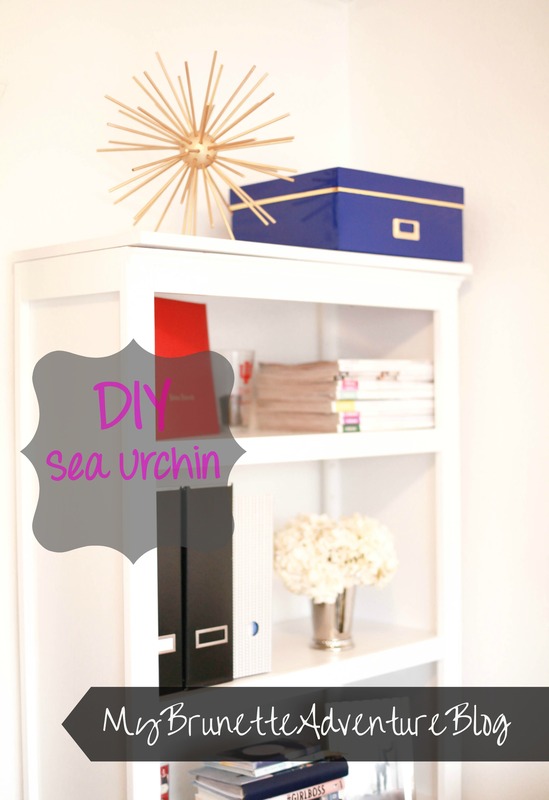 You can also give a last coat of paint to your entire sea urchin. Ta-Da! This will look great on your office shelf or bookcase. 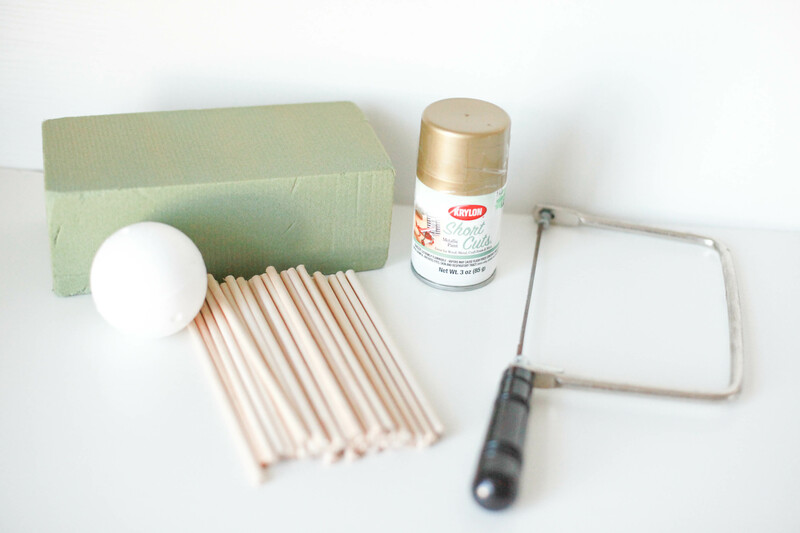 Who will be trying this easy DIY project?